The researchers discovered that levels of the various types of fat (lipids) contained in our muscle cells vary during the day, sometimes favouring one kind of lipid over another. Could a biological clock be at play? The international team has tested the hypothesis with volunteer subjects. They synchronised every subject’s master clock by asking them to adhere to a daily eating and sleeping routine one week prior to the experiment. Every four hours, researchers would take a very small sample of thigh muscle tissue and analyse its lipid composition. The team observed a clear correlation between the muscle cell’s lipid composition and the time of day, explains Howard Riezman from the Biochemistry Department of the Faculty of Sciences, UNIGE, who codirected the study in Geneva with colleague Charna Dibner, from the Department of Internal Medicine Specialties, from the Faculty of Medicine, UNIGE. “As the combination of lipids varied substantially from one individual to another, we needed further evidence to corroborate these findings,” he explains. 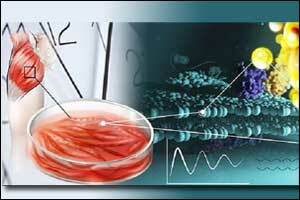 In a second step, the researchers switched to an in-vitro experiment. They cultivated human muscle cells and artificially synchronised them in the absence of a master clock, using a signal molecule normally secreted in the body. The researchers observed a periodic variation in the cell’s lipid composition, similar to what they noticed in human subjects. But when they disrupted the clock mechanism by inhibiting the responsible genes, the periodically changing variations in the lipids were mostly lost. “We have clearly shown that this variation of lipid types in our muscles is due to our circadian rhythm,” explains first author Ursula Loizides-Mangold, from the Department of Internal Medicine Specialties, from the Faculty of Medicine, UNIGE. “But the main question is still to be answered: what is this mechanism for?” Riezman thinks that the biological clock in the muscle, with its impact on the lipids, could help in regulating the cells’ sensitivity to insulin. Indeed, lipids – being a component of the cell membrane – influence the molecules’ ability to travel into and out of the muscle cells. Changes in its composition could tune the muscle’s sensitivity to the hormone as well as its ability to take in blood sugar.